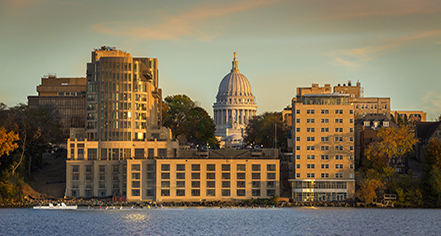 As Madison's first and only AAA Four Diamond property, The Edgewater is situated in the heart of Madison, Wisconsin and invites guests to discover its fine offerings and to learn about the great city it calls home. Just down the street from the Capitol building and its bustling historic square, The Edgewater is close to State Street and its eclectic restaurants and shops. Best of all, the hotel is located next to the University of Wisconsin-Madison and its sports venues, home of the Badgers. Offering over 200 guestrooms, The Edgewater is full of world-class amenities and services, including an outdoor plaza and park, several restaurants and lounges, a luxurious spa, mooring for 40 boats, and extraordinary facilities for meetings, events, and weddings—all right on the shores of Lake Mendota. Throughout the decades, The Edgewater has hosted an array of celebrities, including Elvis Presley, Elton John, Bob Marley, the Dalai Lama, and many other dignitaries. Airport Transportation: While they do not schedule airport pickups in advance, they recommend guests call their main line, 608.535.8200, when they land at Dane County Airport. The hotel operator will then advise on the status of their car service and instructions on where to meet the vehicle. Cancellation Policy: For most reservations, they require that guests make all changes and cancellations 72 hour prior to arrival to avoid a penalty of one nights room charges. Please note that not all reservations have this cancellation policy. Deposit: For most reservations, we do require a deposit of room, tax and resort fee upon confirmation of reservation. This deposit can be refundable, depending on the rates cancellation fee. Please note that not all reservations require this deposit. Hotel/Resort Fees & Taxes: Resort Fee: $15 nightly fee plus 14.5% tax that is applied to all guest reservations. This fee includes wired and wireless internet, two bottled waters, car service to and from Dane County Airport and within a 2-mile radius of the hotel (based on availability), business center access, The Edgewater Fitness Club access and access to The Edgewater Spa steam room and relaxation pool. Parking: Self-parking: $18 overnight (In/Out privileges). Valet parking: $25 (In/Out privileges). Pet Policy: Service animals allowed: Yes. Fee exempt. Pets allowed: Yes. Fee: $100 pet fee plus 14.5% tax. This fee is charged per guestroom, per pet, per stay. Maximum amount: 2 pets per room. Maximum size: Any. Other: Visiting pets are not allowed in The Edgewater Spa or Plaza, however the hotel does make exceptions for service animals. Smoking Policy: Non-smoking property. If there is any smoking damage to a room after a guest checks out, a $250 fine will be charged to their guestroom. Transportation: Their car service offers transportation to and from Dane County Airport and within a two-mile radius of the hotel, including UW-Madison. This is based on availability at the time of request. 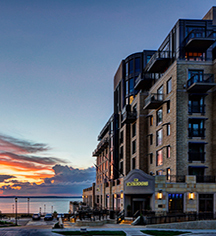 The car service runs from 6:00 a.m. to 10:30 p.m..
As Madison's first and only AAA Four Diamond property, The Edgewater is situated in the heart of Madison, Wisconsin and invites guests to discover its fine offerings and to learn about the great city it calls home. Learn more about the History of The Edgewater .